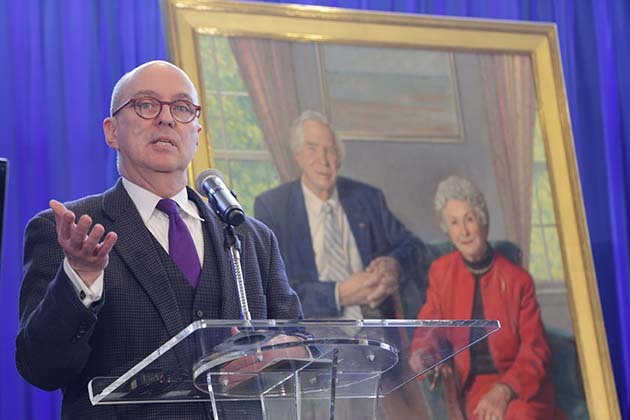 On February 10, the National Library of Medicine was the scene of a special unveiling ceremony for a portrait of former NLM Director Dr. Donald Lindberg and his wife, Mary. Dr. Lindberg retired in 2015 after over 30 years of service as NLM Director. During his tenure, the Lindbergs were a much-admired team, always closely involved with the people and activities of the Library. The painting was created by Virginia artist Bradley Stevens, one of America’s leading realist painters and a noted portraitist. Commissioned and sponsored by the Friends of the NLM, this beautiful new work will hang in a prominent location at NLM. 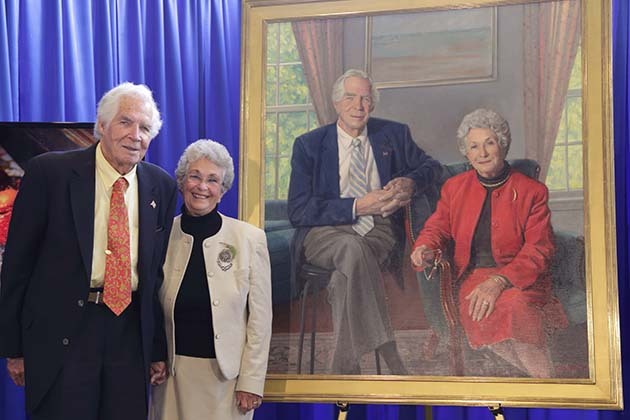 Dr. and Mrs. Lindberg pose next to their official portrait during the unveiling ceremonies at the National Library of Medicine. 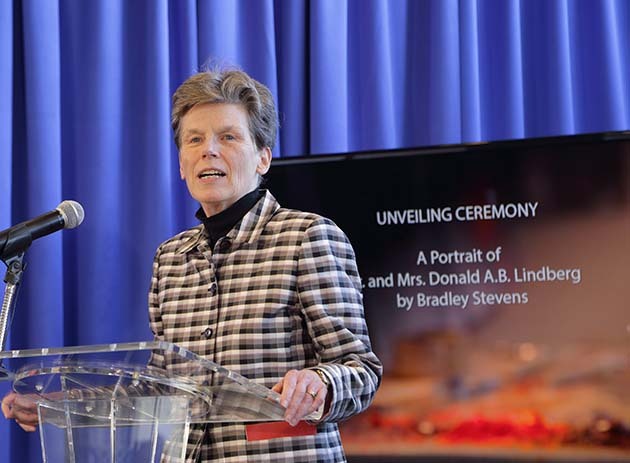 Betsy Humphreys, Acting Director, NLM, delivers opening remarks at the Lindberg portrait unveiling. 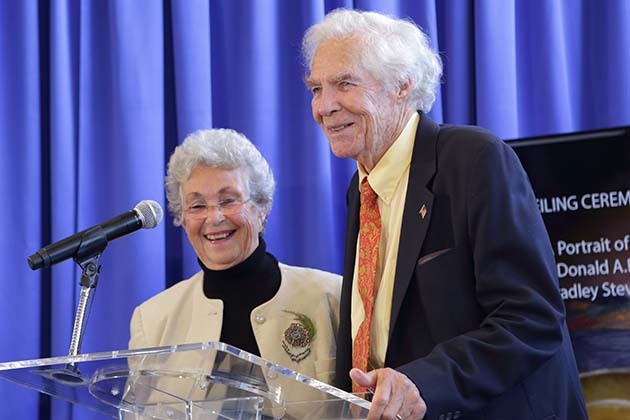 Dr. and Mrs. Lindberg warmly acknowledge those gathered for the portrait unveiling. 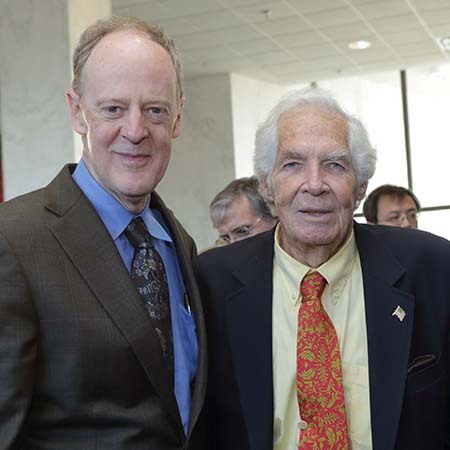 Noted portraitist Bradley Stevens stands with Dr. Lindberg during the reception following the unveiling. Glen P. Campbell, Chairman of the Friends of the National Library of Medicine, recounts Dr. Lindberg’s impact during his time as NLM Director. February 12, 2016 in People.